When is it the right time to use heat to treat my injury? Only once the pain and swelling (inflammation) has ceased should you apply heat. Do not apply heat after an activity or if you have an acute injury. Be careful when applying heat to chronic injuries that are caused by over use. You can use heat on a chronic injury that is not swollen or in pain. In most instances Blood Flow Stimulation Therapy is a much better choice for injury treatment than using heat or hot packs. Use heat only when the pain and swelling is under control. Always start at the lowest level and only increase the heat if there is no additional pain. When you are at rest and your injury is protected you can use heat to loosen the muscles around the area and help the tissue relax. Tight muscles can be holding open small tears in your tissue, preventing it from healing. Use heat only for short durations of 30 minutes or less so you don't overheat the tissue. Give your injury a chance to return to normal temperature before applying heat again. Don't use ice to bring the tissue temperature back down. Let the body return to temperature naturally. Heat can help some injuries to heal. For rapid healing use Blood Flow Stimulation Therapy instead of heat. Use Heat To Relax the Muscles. Heat can be very effective for relaxing muscles. Even if the muscles in the area of the injury are not hurt themselves, tense muscles can put strain on other tissue in the area making things worse. So relaxing those muscles can help take the strain off your injury. In the first 48 hours, do not use heat after a serious injury, use ice. If you mildly re-injure the area after it has started to heal, do not use heat until the new re-injury has stabilized, wait 4 to 48 hours depending on the severity of the re-injury. If you have a lot of swelling and pain, don't use heat. First thing in the morning is a perfect time to give yourself your first treatment of the day. It will help warm and loosen up the injured area before you take on the day. While you sleep the muscles around the injured area can tighten and blood flow can slow. A BFST® treatment in the morning will limber the area and stimulate the blood flow needed not just to heal, but to support your increased level of activity you have during the day. It is recommend you do 4 to 6, twenty minute treatments each day. The BFST® products are portable. You can take them with you and all you need is an outlet to plug it into. Use it while at rest to give yourself a 20 minute treatment during the day. from the heavy strain they are about to endure. Blood Flow Stimulation Therapy is the envy of the heating pad. 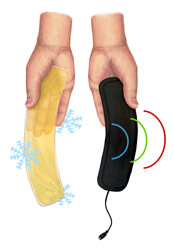 Where heating pads can cause an increase in blood flow at the surface of your skin, Blood Flow Stimulation Therapy (BFST® for short) works deep beneath your skin to promote circulation in your muscles, ligaments and tendons. BFST® is designed to increase blood flow in the injured tissue resulting in accelerated and more complete healing. A BFST® device is like a heating pad on steroids only not as hot. It too will help to loosen tight muscle/ligament/tendon tissues and it also stimulates your blood flow to the affected area. It's so much better than just your standard heat pad. It provides deep penetrating heat similar to how it would feel sitting out in the sun. It warms you to the core and helps to stimulate the blood flow that will provide the injured body part with the nutrient rich oxygenated blood it needs to heal more effectively. Most people don't realize that blood flow is the most critical element in rapid recovery for injuries of the ligaments, muscles, and tendons. King Brand Healthcare's BFST® uses a patented Energy Web® technology that emits EMR (Electro-Magnetic Radiation) energy. The energy is controlled and guided to surround the injury and promotes blood flow to the deep soft tissue beneath the skin. This technology provides the blood flow necessary to recover from an injury quickly and completely. The more you stimulate your blood flow, the more you stimulate the healing process. So, the more you use your BFST, the more benefit you will gain from it. If you use it 4 times per day, that's better than 2. 2 is better than 1. It is better to spread out your treatments over the duration of the day than it is to take them close together. Back to back BFST treatments without a period of rest in between is not much better than just 1 treatment. 1 treatment affects the blood flow in your body for hours after the treatment ends, so spread out the treatments and do them often. The effects of BFST® treatments are also cumulative. That means the more regularly you get them the more you will gain from each treatment. This is a lot like exercise. 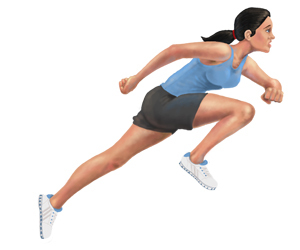 In fact, BFST can be thought of as exercise for your circulatory system. The more you exercise the stronger your body becomes and the more powerful you are. The more you exercise your circulatory system the stronger it becomes and the more effective it is at providing blood flow. This cumulative effect can be noticed after a period of treatments. The first time you give yourself a BFST treatment the treatment will feel quite warm on the low setting. After each treatment though, the warm feeling gradually becomes less and less apparent until you can hardly notice it. This is because your circulation is improving and the heat generated by the treatment is removed more quickly by the increased blood flow. As you progress with more treatments and move up in power levels the reduction in noticeable heat continues. BFST® treatments should never feel hot. If they do you are using a power level higher than you are ready for. If you feel a lot of heat at the lowest setting this simply means you are starting with severely impaired blood flow so you may need to reduce your treatment times at first, perhaps to even just a few minutes. Over time, as your blood flow improves, you can work up to the 20 minute treatments and eventually higher levels. Exercise your circulatory system regularly. Your injury will benefit from it. Note from KB WebMaster - The text below is primarily intended to assist with Google properly classifying this page content. To learn more about our products please visit our website.<br>Heat is a misunderstood concept. Heat should be used after the inflammation has gone away. Heat heals the injury. heat can impact your injury in many ways. heat can be used to help you with your injury but BFST will help you heal. heat affects blood flow and blood flow is important to healing. heat that is too hot can cause further damage. dont use excessive heat.